One of the biggest frustrations in working at Xerox’s PARC (Palo Alto Research Center) or Bell Labs had to be having out-of-focus images of what new ideas, technologies, products were going to be here in 10-20 years while working with stuff that was introduced five years ago. At the same time, the board of directors and stockholders were constantly hammering on you to instantly deliver the next breakthrough, innovation NOW!!! The stress has been even worse the last few years because budgets were cut across the board and everyone was forced to do more with less. The funny thing is though, the approach/process management had for developing new ideas and turning them into products/services didn’t change that much during the financial crisis. 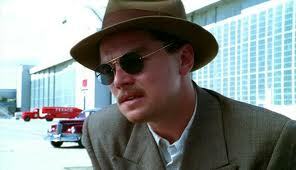 You could be depressed with where we’re at, where we’re going and how we’re going to get there. It takes events like the TED (Technology, Entertainment, Design) conference to give you a sanity check, renew your optimism. The great thing is you can catch the best of TED online such as Peter Diamandis’ Abundance presentation this year. Makes you proud to be in the technology industry. 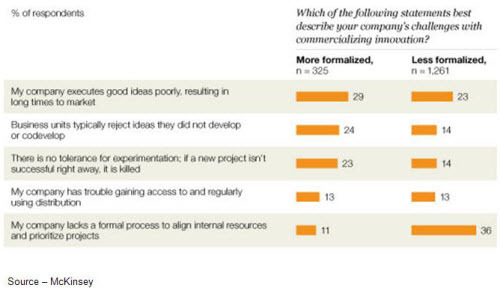 Makes you want to go out and innovate … something. The one thing that has returned is our investment in advancing technology and making true innovation a part of the company’s strategic planning activities. We’ve gotten over that business phase of growing by “buying” into new markets with M&A (mergers and acquisitions) focusing more on producing organic growth with new products/services and new customers in existing markets. 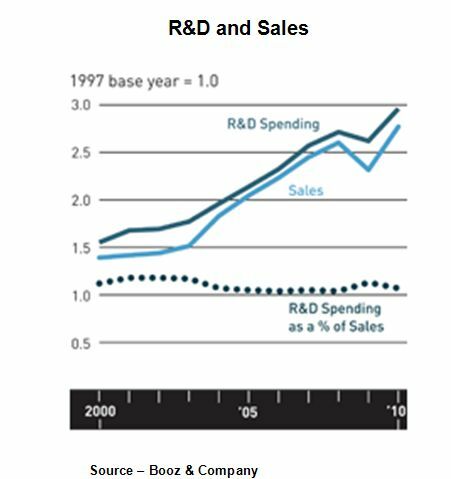 What we’ve seen in recent years is that simply throwing money at R&D doesn’t produce innovation. 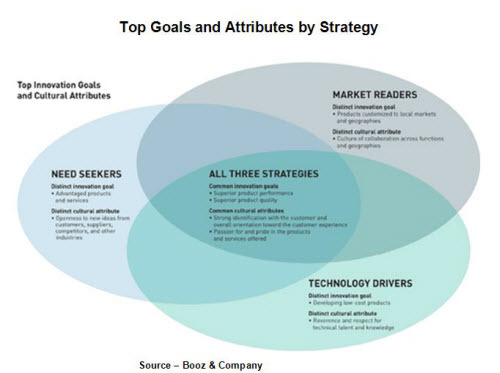 The big difference, according to people who study these sorts of things – Booze, McKinsey, others, is that there was a clear set of strategic corporate goals … clearly articulated, focused direction. You’ll notice that few organizations placed having the cheapest product, getting there first or making very sure it was going to be a successful product at the top of their lists. That sounds simple enough, but the true test is when senior management only gives lip-service to the first four of their “goals” and holds the innovators accountable/responsible for the goals at the bottom of the list. Actually, if you look at the three categories you can probably identify companies that seem to move seamlessly from one category to the other with mixed results. But jumping around and winning consistently doesn’t seem to work. It probably has more to do with the phase of the moon or dumb luck. When management constantly shifts their goals and their strategy it, makes it difficult – if not impossible – for innovators, developers to figure out which path they can/need to follow. Need seekers that have their strategy aligned with their business strategy and the company in addition to a culture that nurtures and supports innovation produce the best results. If you look at companies you see as focusing on need seeking, you’ll see they also financially outperform the competition that follow the other strategies. The need seekers seem to have an aura around them that delivers innovation after innovation and it’s primarily because innovation is an integral part of their culture, their business strategy. 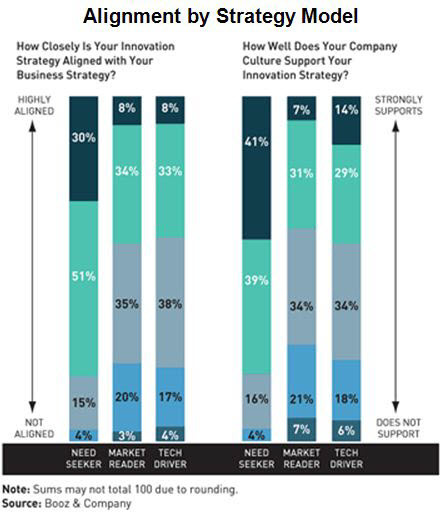 Of course, there are also a number of companies that make their living out of closely following the need seekers delivering the cheap copy of part of the innovation and just can’t figure out why they haven’t moved up the food chain. The problem is the innovation isn’t a piece of hardware or a piece of software; it’s the product quality, performance and total customer experience. We can all think of a product/service that has been rolled out as being the “XYZ killer” because it looks about the same, does about the same thing, is insanely cheaper and…bombs! Then there are the folks who constantly change their strategy and have an even worse track record. We can all cite at least one company that announces every six months that they are going to firmly follow their new strategy. But now that the industry is focusing on growth – not just survival – innovation has to be a firm commitment of management that is communicated throughout the organization–not just verbally but as a goal, strategy, a policy, a priority. Getting the word out and making it credible is one of the toughest challenges facing management. After years of constant pressure to perform/survive/thrive with less and without taking undue risks, it’s realistic for employees, engineers, innovators to be a little skeptical. After all, they’ve seen too many good ideas die of old age, too many good ideas rejected and too many folks fired because the good idea didn’t meet someone’s expectations of how success was really measured. The challenge is that there is still no way to measure with certainty if an innovation is going to be embraced by the consumer and succeed. And in fact, every year, there are tons of good, even great, innovations milling around the industry that are poorly commercialized and don’t survive. That isn’t the problem of the innovators, designers, developers, engineers; that’s the problem of leadership and the “tried and true” organization. One of the biggest, most fruitful changes being made is the breaking down of the NIH (not invented here) syndrome and a greater focus on partnering with suppliers, competitors, customers. That was one of the most eye-opening points we got out of Diamandis’ Abundance presentation at TED. We recently surpassed seven billion people on the planet; and by 2020, more than three billion of those people will have internet access, which means your organization has almost instant access to what they are thinking and how they work. If you look back at the last decade, it was relatively dull because we were all focusing on costs, survival. So far, we seem to have returned to our growth focus. The biggest question is if the industrialized countries are going to be able to not only maintain but accelerate their innovation leadership. 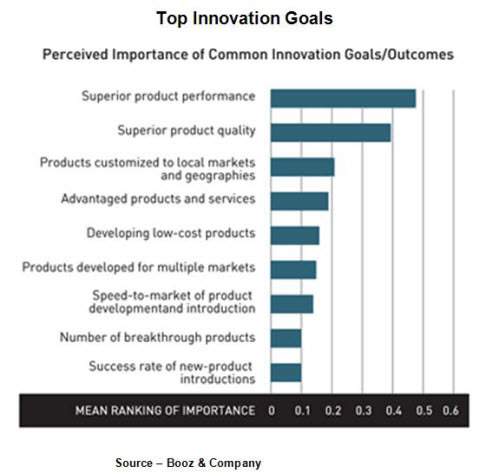 The key is past and projected investment in innovation. While the industrialized countries spend more on R&D and innovation than countries like India and China, they not only have the money but they’re investing at a far greater rate than the ROW (rest of the world). True, they copy a lot of the good stuff and flood the markets with bad imitations. True, the ability/willingness to prosecute the knock-off companies seems to be lacking. True, companies have to become more aggressive in challenging these countries to protect IP (intellectual property) or face reverse innovation drain…or worse. While their bread and butter may be the garbage, they are also making huge investments in technology – solar energy, communications, and transportation. As they become more involved in the total technology innovation arena, they will be more interested in making certain their innovations are protected so they can compete on an equal footing. The rate of change is accelerating. And there’s a lot to be done; innovators – managers, designers, developers, marketers – can really change what tomorrow looks like.